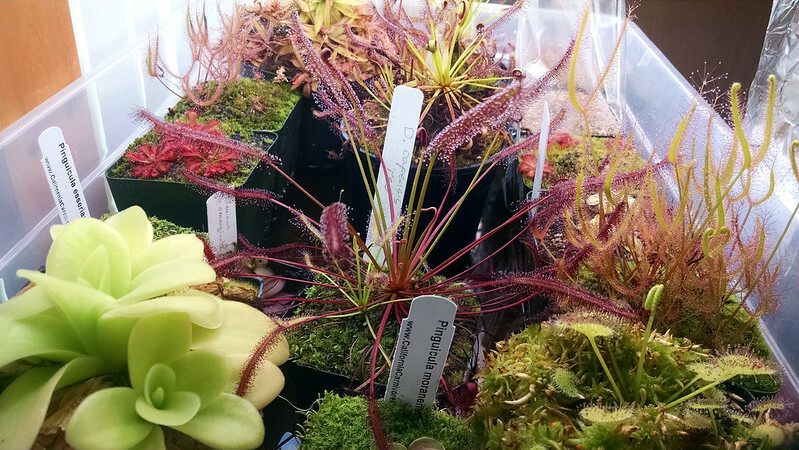 The Drosera capensis mini collection |Sundews Etc. One of the great things about collecting sundews is that genus Drosera is so widespread and varied that there are all sorts of sub-collections to collect. There are the Three Sisters, the pygmies, South American sundews, tuberous species, and on and on. 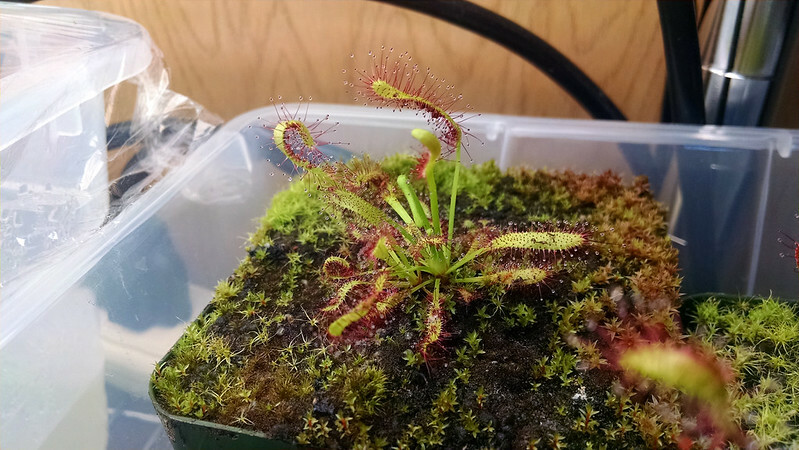 One of my favorite mini-collections is the Drosera capensis complex. It's a highly varied plant, with distinct types having been found in the wild and developed in cultivation. It's also very easy to cultivate, though to look its best it needs really bright light. The most commonly-available form of D. capensis is usually styled "typical." Under ideal conditions it has deep red tentacles, bright green petioles and laminae, and mostly upright leaves. The flowers are lavender-pink on long fuzzy scapes. D. capensis typical, getting a bloom started. This is the baseline against which the other forms are usually compared. 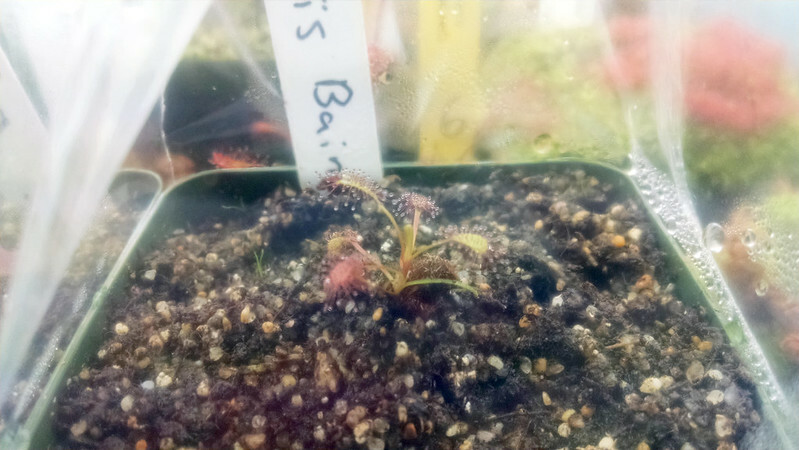 Pretty much everyone who grows carnivorous plants will end up growing D. capensis typical, since it's a famous weed. It's a great plant! The only registered cultivar in this complex is D. capensis 'Albino'. It has been referred to in some places as D. capensis 'Alba', but that's not an official cultivar name, and it risks confusion with the South African species Drosera alba. A pair of D. capensis 'Albino' bunking together. This a a mutation that arose in cultivation. The leaf shape is pretty much identical to the typical form, but the tentacles range in color from pale pink to totally white (depending on light intensity and frequency of feeding), and the flowers are white. This is another extremely common plant, but it is absolutely lovely. The pink blush makes the laminae seem like they're glowing. 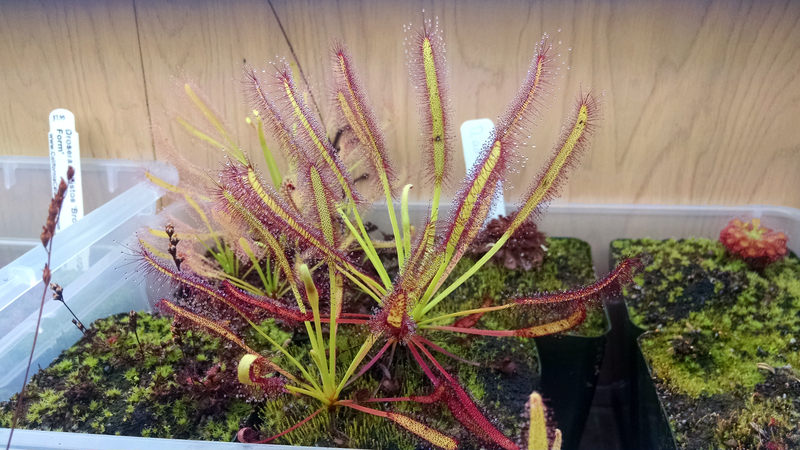 The red form of D. capensis hasn't been registered as an official cultivar, but it really should be. Under bright light and without too much feeding the entire plant turns a deep, almost maroon red. Regular feeding will lead to greenish color on the leaves for a while. D. capensis red form with hitchhiking D. 'Albino'. The color isn't the only distinctive characteristic of this plant, however. The petioles and laminae are half again as long as the typical form, and overall the plant is less fuzzy. The flowers are also larger, redder, and longer-lasting than a typical D. capensis. 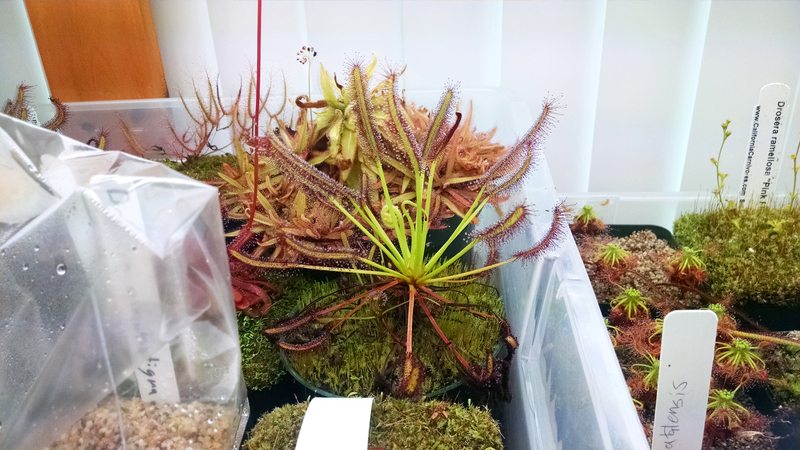 I have one D. capensis form based on leaf shape, the so-called "Broad leaf" form. This is another plant that is widely recognized, but not registered as a cultivar. A couple D. capensis "Broad Leaf" growing very well. The coloration and general habit of the plant is very similar to the typical form, but the laminae are wider and flatter-looking. These specimens aren't as extreme in this characteristic as some I've seen online, but since this isn't a registered cultivar it's difficult to say if that's a result of different growing conditions or different clones or what. It's still a noticeable trait. The last form I currently have is a location form, D. capensis Bainskloof. This is a particularly lovely form with a tighter rosette and a wonderful curving leaf shape. My two plantlets are too young to be showing these characteristics this far, but I'm really looking forward to growing them out. Recently potted-up D. capensis Bainskloof. Cutie! There are several more location forms out there, as well as things called "Giant" or "Pink" or "Narrow Leaf." It's clear that there is work to be done describing this complex of plants, both on a scientific and a horticultural basis. I know I'm always looking for different varieties so I can grow them in similar conditions and see the differences. 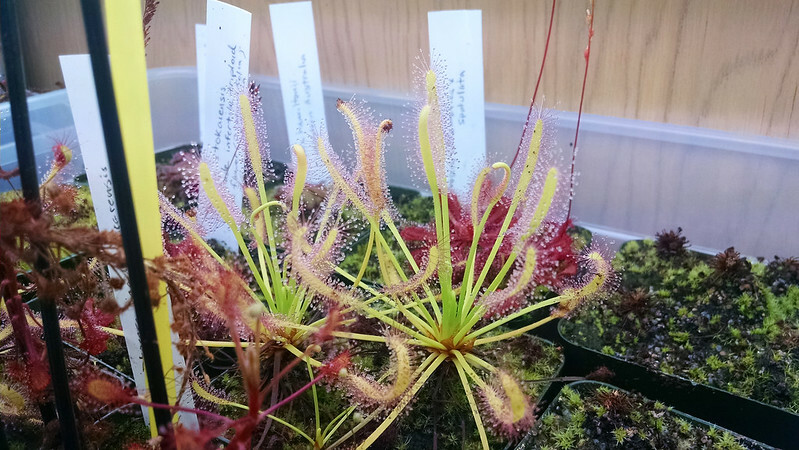 Luckily it seems like there has been a bit more attention being paid to D. capensis lately, which can only be good for the hobby. These are really wonderful plants.